Giant Orange Ribbon Cutting Scissors with and stainless steel blades. Available in 25 inches or 30 inches in length. Customization option available on blades. Elegant Pink Ribbon Cutting Scissors with sturdy, pink handles and silver blades. Available in 25 inches or 30 inches in length. Customization option available on blades. Elegant Teal Grand Opening Ribbon Cutting Scissors with and stainless steel blades. Available in 25 inches or 30 inches in length. Customization option available on blades. Elegant White Ribbon Cutting Ceremonial Scissors with silver blades. Available in 25 inches or 30 inches in length. Customization option available on blades. 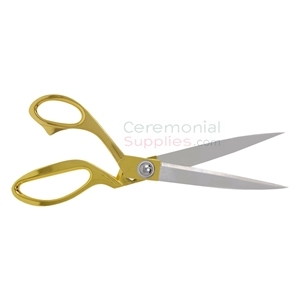 Elegant Yellow Ceremonial Ribbon Cutting Scissors with and stainless steel blades. Available in 25 inches or 30 inches in length. Customization option available on blades. These two-toned ribbon cutting scissors help you personalize your ceremony to your brand's identity. They are available in 25 or 30 inches. Color combinations include : Red/Blue, Red/Black, Black/Blue, and Light Blue/Royal Blue. 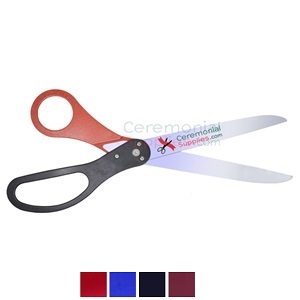 If custom ceremonial scissors with a logo and text are not enough personalization, the Full Custom Two-Tone Ceremonial Ribbon Cutting Scissors allow you to further customize by letting you choose a handle color combination. Coordinate the colors of the handles and the ornate custom logo and/or text on the blades to represent your brand to the fullest. The scissors are available in sizes of 25 or 30 inches. Currently, the available handle color combinations are Red/Royal Blue, Red/Black, Black/Royal Blue, or Light Blue/Royal Blue (only available in 25”). 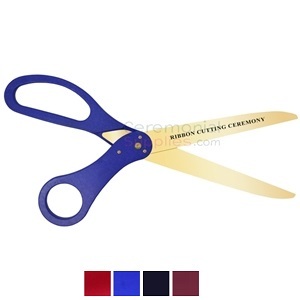 Display the ceremonial scissors for your ribbon cutting on a pedestal that reflects the grandeur of this big event. The Deluxe Chrome Ceremonial Scissors Display Stand is the exactly that. This high-luster mirror polished chrome stand is top quality metal. Accommodate the height of the arm up to almost 3 ft. for a convenient reach. Grand opening scissors have made ribbon cuttings a tradition for new businesses. Being more than a novelty item, giant scissors have made their way into the hands of small business owners, corporate executives, celebrities, and even politicians. Grand opening ceremonies are a surefire way to get all eyes on your business from the moment you announce it to the public, which is why they have become an important part of every new organization's marketing strategy. While a soft opening merely gets you the attention of passersby, a grand opening amplifies your message to reach your entire community, and if done right, the endeavor can go even global. Grand openings are great marketing and PR opportunities that not new business should pass up. We hope to give you the insight and resources to make the most out of your event planning. Why Are Grand Opening Scissors So Big? Grand opening ceremonies are held with the intention of promoting a business at its early stages to draw attention and stimulate some early buzz—and hopefully revenue. Giant grand opening scissors help accomplish this is several ways. First, the most obvious part is that they call attention to the ceremonial stage. It is a very interesting sight when a giant pair of scissors cuts through extra wide ribbon; it is one that no one wants to miss. A ribbon cutting provides an opportunity for the speaker to deliver any message right before the actual ribbon cutting while all the attention is on the grand opening stage. To take advantage of the attention, grand opening scissors can include branded customization like logos, slogans and/or company name, which will be easily visible on the giant blades. These markings will not only be seen at the event, but they will also be captured in images of the ribbon cutting. Something as simple as a logo next to the 'Grand Opening' text can have a positive impact on branding and giant scissors deliver it best. Not to mention, the exaggerated size of the scissors likens them to the grandeur of the ceremony's significance. Although Grand openings are considered PR and marketing events, they do have special (personal) significance to the people involved. The organization's founders, the managing partners and anyone who had a helping hand in the development of the new business. These are the people who are more likely to be the ones performing the ceremony. In many cases, more than one pair of scissors may be used simultaneously to include all of the VIPs, but if only one pair is possible, the ideal person should be the one who made the business come together. 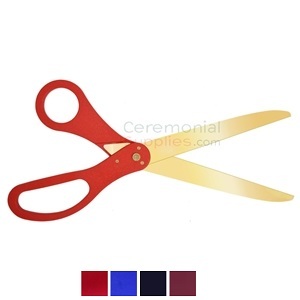 CeremonialSupplies.com can supply your event's top participants with high quality ceremonial grand opening scissors at budget-friendly prices that any new business owner will appreciate. Our scissors are available various colorful handles and metallic finishes including stainless steel and golden. 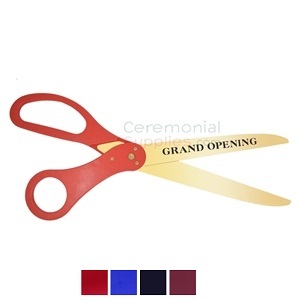 Contact us to discuss your inaugural event planning needs and to find the most adequate pair of grand opening scissors and other supplies for your budget—1877-373-4273 or e-mail sales@ceremonialsupplies.com.